Mrs. Annie Faye Chambers McBrayer, 85 of Bremen passed away at her residence on September 3, 2018. 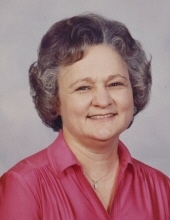 Mrs. McBrayer was born on July 13, 1933 in Bremen, Georgia. She was the daughter of the late Comer Chambers and Fannie Hobbs Chambers of Bremen. She was a member of Covenant Life Church of God in Bremen, pastor’s wife, leader of Christian Clubs and the President of the Ladies Ministry. She was a retired educator of Haralson County Board of Education. Also a member of Haralson-Bremen Retired Educators and Kiwanis Club of Haralson County. She raised four children, completed three graduate degrees, worked full time and supported her husband’s ministry while they moved around the country for 61 years, and moved 22 times! She was a master seamstress, making clothes for children and grandchildren. She did love to shop! In addition to her parents, she was also preceded in death by sisters and brothers in law, Ruth and Ernest Dewberry, Clara and Ernest Waites; brothers and sisters in law, Ross and Willie Chambers, Herman and Ethelene Chambers; brother, Kermit Chambers; and granddaughter, Macy Claire McBrayer. She is survived by her husband, Dr. Richard Terrell McBrayer, Sr. of Bremen; children, Rebecca “Becky” and Dr. Gregg Farmer of Panama City Beach, FL, Barbara and Reverend Steve Brown of Villa Rica, GA, Richard T. Jr. and Melinda McBrayer, of Alpharetta, GA, and Donna and Rob Maynard of Atlanta, GA; sister, Betty Jo Chambers and Jim Farmer of Houma, LA; brothers in law and sisters in law, Van and Judy McBrayer of Buchanan, Jerry and Sandra McBrayer of Bremen, Imogene Keaton of Mableton, Martha Puckett of Bremen, Dr. Danny McBrayer of Bremen and Betty McBrayer of Powder Springs; grandchildren, Lydia Brown Waters of Bremen, Heather Brown of Smyrna, Drew Farmer and his wife Ely of Lawrenceville, Josh Brown of Smyrna and Maddie McBrayer of Atlanta; great grandchildren, Allison Farmer, Micah Waters, and Breckyn Waters; fifteen nieces and twenty-three nephews. The family will receive friends on Tuesday, September 4, 2018 between the hours of 5 and 8 pm and on Wednesday, September 5, 2018 between the hours of 1 & 3 pm. Funeral Services will be conducted on Wednesday, September 5, 2018 at 3 pm from The Chapel of Hightower Funeral Home in Bremen with Reverend Steve Brown and Reverend John Butler officiating. Reverend Steve McBrayer and Reverend Dr. Robb Blackaby will conduct the graveside service. Music will be provided by Harold McWhorter, Josh Brown, Betty McBrayer, Becky Farmer, Barbara Brown and the McBrayer Family. Dr. Gregg Farmer, Rob Maynard, Keith Chambers, Drew Farmer, Ricky Farmer, Tom Reckert and Josh Brown will serve as pallbearers. Interment will follow in Forest Lawn Memorial Park. To plant a tree in memory of Annie Faye McBrayer, please visit our Tribute Store. "Email Address" would like to share the life celebration of Annie Faye McBrayer. Click on the "link" to go to share a favorite memory or leave a condolence message for the family.